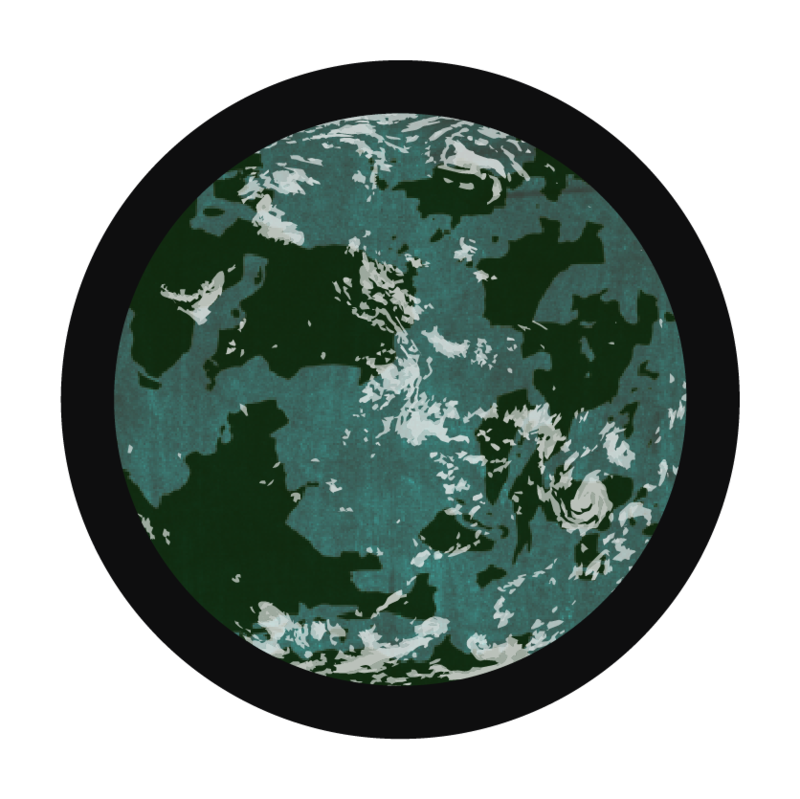 The Ancient Planet, known as Kadaun in Didenki, is the largest inhabitable planet yet discovered. Kadaun is located in a galaxy not far in proximity from the Milky Way, but rather, far in dimension and reality. All matter on Kadaun is made from Omyn Atoms, and four genetic Omyn-types - Enfamuy, Arlomuy, Finomuy, and Lyfamuy - originated there. Kadaun is home to three ancient races, and in modern times, a fourth emerging race. They are the Arlomin, Vfinom, and Senfamin. The fourth is the Gindeki, outcasts who bear Lyfamuy, yet have not been banished to Masera for unknown reasons. All speak ancient Didenki. Masera is one of Kadaun’s seven moons, yet it is the only one able to sustain life. Like its mother planet, Masera is entirely comprised of Omyn atoms. However, Masera does not produce its own daylight. It absorbs Kaduan’s natural light. It’s said Masera had no soul-life of its own, but rather, convicts—or in some stories, rejects—from Kadaun's three races were exiled there. Among them was the notorious Lyfel, a Senfamin said to have brought evil and fear to the Ancient Planet. From the children of these three races emerged new kingdoms and peoples: the Amesytins, the Somorrins, the Oranu, and the Trajonyts. The wildlife of Masera is generally violent and hostile. Plants are often poisonous and/or carnivorous. Because of this, Maseruy civilizations are under constant vigil and build walled fortresses. They spke Maseruy Didenki before Masera was destroyed in The Great Conquest. The Shadow Planet Theory, developed by leading Erbedian minds, states that Erbede and Earth are corresponding counterparts revolving on opposite poles of the same orbit around the same respective sun in the Milky Way Galaxy. This means: Erbede and Earth never meet because they are fixed on the opposite sides of the same sun. A fact proven by their corresponding constellations. The two planets are laced together via Omyn Spacial-portals which naturally open and close regardless of omynuy prevention or origin in specific regions such as caves and aquatic trenches. Erbedians knew to look for earth because their verbal history contains accounts written by Erbedians who traveled to and from Earth just as they traveled between the other planets before The Great Conquest. 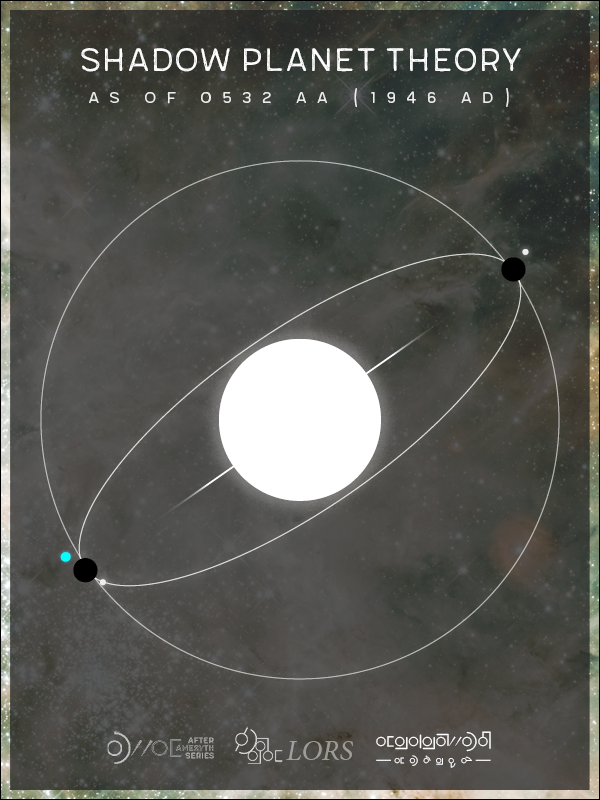 These two planets were finally reunited in 0532 aa or 1946 a.d.
Earth is much larger than Masera, much smaller than Kadaun, and slightly bigger than Erbede. Despite its 8 billion people with thousands of languages and notable topography, it is almost entirely Omynless and inhabited solely by Humans. Erbede is just smaller than Earth and also absorbs energy and light from its Solar System’s local sun. Though its geology and atmospheric makeup aren’t Omynic, they neither foster nor inhibit Omyn lacing in organic life. Every known people group has inhabited Erbede, though it orignially had only four native peoples. Until recently, not much was known Ma'ru. Turns out, the Ma'ru'fo, a people with tail fins instead of feet and gills as extra lungs, originated there. The meaning of the name, "Ma'ru'fo," is their ancient term for "Moon Beam." Just like most real sisters, Earth and Erbede have many similarities and a special relationship. For one, they had no choice in the matter. They're connected, and there's nothing anyone can do about it. Earth and Erbede share not only their constellations and orbit around the sun, but also plants and wildlife. Not merely "histories," mind you - Histories with a capital H. There is a difference. There were several points in time when massive events caused genetic drift and gene flow to occur in omynuy, bringing about new people groups and mutated Omyns. Though these events happened on the same timeline, they will be separated by planetary origin to aid understanding. The languages used in the actual History texts are ancient forms of Didenki and Erbedian, so the aaS team will simply paraphrase and summarize the content as best as we possibly can in English. On the Ancient Planet, there were three groups: Vfinom, Arlomin, and Senfamin. These three groups generally lived and married within their respective communities. In fact, Historians speculate that only 1 in 3,000 couples were of mixed heritage before 3000 ta. Not that they had anything against one another. Quite the opposite, there are many traditions which teach the three groups admired one another, but felt more comfortable, more integral in their own cultures. Fascinatingly, Lyfel’s Rebellion changed this reality for only a handful of omynuy from each race. Yet billions of people have descended from this handful, and more are being born everyday. History says Erbede’s civilizations began with four people: two Nimvs, and an Insashal and Lishadin. The Nimvs had Nimv children, and the Lishadin and Insashal had their own children. These children could marry whomever they wished, so from the Nimvs and the Insashal and Lishadin arose the Shintyr along with more Lishadin, Insashal, and Nimvs, creating three distinct people groups and civilizations. Through many generations of beautiful children and prosperity, the Insashal secretly loved the Nimv man who was not her husband. Long story short, she enticed him into falling in love with her, and then she grew hateful when she was convicted of wrong. The Nimv-man also felt guilty, but he chose to confess what had happened and begged for forgiveness. Seeing he was sincere, he was forgiven and reunited with his wife. The Lishadin hoped this would be true of his wife as well, so he sought her that he might restore their relationship. The Convergence happened because of the creation Omyn portals between the two systems sharing the Milky Way Galaxy - that is, between the two dimensions of our realities. King Ayris Fulkert united two worlds which had been foreign to one another since the beginning of time. Yes. His Omyn created a portal which united Masera and Erbede. The Fulkert family strain of Finomuy was capable of bringing together worlds with cultures and omynuy who had never had contact with one another before. This caused a migration and trade boom that lasted almost 150 years in which Maseruy, and even some ancients, established colonies and settled on Erbede, creating a trade demand for exotics: mostly plants, animals, timber, metals and gems, and technologies. Earth’s history is a special one unlike the other histories. After decades of studying this convoluted mess of generations and languages and religions and wars and genocides and talking to Erbedian colonists, we think we’ve pieced together an idea of what happened with humans. Probably... maybe... and by "we," I mean Ambassador Etti Rekardo, because I’m certain he’s the only person on Erbede who can even come close to understanding the mess you’ve gotten yourselves into. So humans were made as humans, it seems, with no Omyn and little survival skills. One Historical account says the first two humans didn’t even have children before they messed everything up. Wow. For Erbede, that’d be like the Insashal killing her husband on their wedding night; or for Kadaun, it’d be like one of the original Senfamin walking into the forbidden cave the minute he was told not to. Then when the first two humans did have children, one of their sons killed the other. That’s not even one generation gap! Uh, that’s kind of pathetic, and it’s only downhill from there.